Today, I caught up with an old friend. He is not old, it’s just that we have been friends most of our lives. It is a friendship that has cemented over time. I don’t see him as often as I should and sometimes, long gaps fill the spaces between our meetings, but every time we see each other, it is as if we have never missed a day. We spent the afternoon walking in a woodlot that my friend owns. We discussed plans for its future. We decided upon a sustainable plan of woodland management that will pay dividends for many years to come. The woodlot will remain and become even better over time, through selective harvests and longterm management. My friend and I have had many of the same twists of fate in our life journeys thus far. We parallel in many aspects. We enjoy many of the same things, some of which are environmental conservation, hunting and all things out-of-doors. 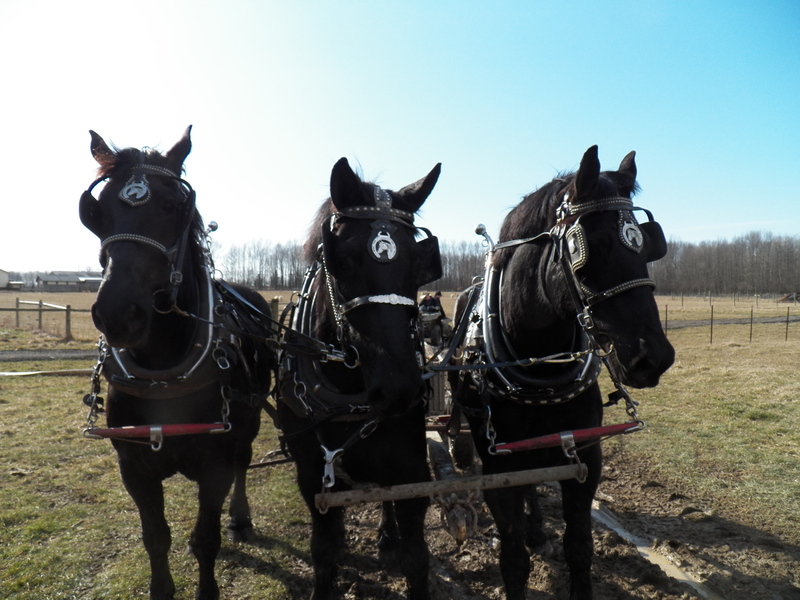 Sustainable logging, using draft horses, makes good sense to both of us and a great fit for our proposed plan. We shook hands when we parted. My mind filled with childhood memories that we share. A peace came over me and I felt glad to have such a friend. I am sure that he felt the exact say way. There is no way to put a price tag on friendship such as this. Like the commercial says ….. Its Priceless. The work continues to wind down here on the farm. A season of sledding and fun awaits us. I think getting wood in with the horses is a fun job. It sure makes me feel good anyway. They simply move the heavy weight so easily, it’s fun to be a part of it. They amaze me with their grace and strength, even after twenty-six years of using horses. They truly are gentle giants. I am glad to have them as pals. The stresses of life, drift off my shoulders, as we work this farm together. Three horses and a crisp, late fall morning … it just doesn’t get any better than that! Today and tomorrow we will be enjoying some unseasonable weather. They say temperatures up into the sixties! I hope to complete the last remaining “good” weather jobs. The weatherman says rain and snow the end of the week …. Yep…Snow…Here comes Winter! This morning frost and light fog cover the farm. It wasn’t long ago when heat and drought were the order of the day. Our drought is over, the ponds and creeks are full and soil moisture has returned to normal levels. Our harvest is complete and many nearby farmers are closing in on the last few acres of their 2012 harvest. It is a good feeling. We are sending a few chickens to freezer camp, gathering in a little more firewood for my sons and just putting equipment under cover. The wet snow will remind me of all the things that I have forgotten, but I think we are in pretty good shape. We have much to be thankful for this year as always. Tomorrow we will pause and reflect on the many blessings we have been given. The stores will come alive with Christmas advertizing and sales. Many sportsmen will gather to watch football and plan their deer hunting trip…all of these things are signs that winter is surely here. Why is it that when animals are turned into a new pasture, the first thing they do is walk the perimeter? I guess it’s just like teenagers who have to see if an eleven o’clock curfew really ends at eleven o’clock! I am thinking that pushing boundaries is in our nature. I think it’s how we discover new things. Some use this desire to push in wrong directions, like how to steal something, others use it to figure out how to make water pure. I guess the drive to explore the limits is as good or as bad as the person doing the exploring. 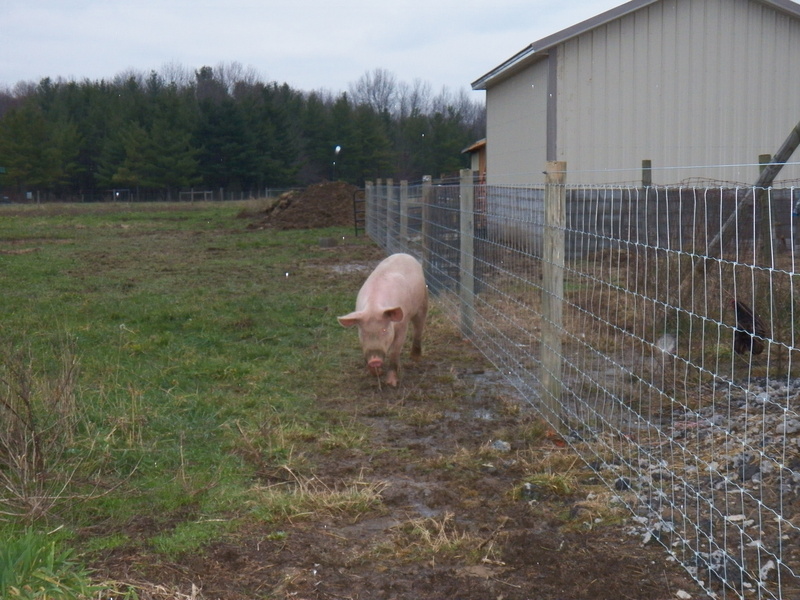 Our sows are in a pasture that contains 2.5 acres of land. They spent half of the first day walking the fenceline to see if there was an opening other than the usual gate. So far, they have not created an opening of their own. I think they are now very content in their little grassy hamlet. I think that may be the key…finding happiness with what we have. Staying inside the lines, yet reaching out to make things interesting and finding a way where none existed. There is much wisdom in the past, searching out what worked back then and adapting it to a modern problem is a wonderful thing to do. I am working on a way to graze my sheep year-round. I know it can be done even in our snowy winters. I will continue to push the limits, use old farming techniques and re-think what the experts tell us. I am way ahead of most of them, only because I am guided by the past and common sense . I can build on what works … result driven experience that can been seen in my farming methods and the health of my livestock. I will pretty much stay in the lines, but can be counted on to shout for small farming and methods tested decades ago when petro-chemicals and agribusiness were not the voice of farming. Our food was not connected to oil…but rather…. SOIL ! Jake, my youngest son, is working hard on a small pole building for keeping his tractor and equipment in. He, like me, is running out of good weather. He breathed a sigh of relief the other night as the roof shingle job got completed. All of us here are scrambling to get jobs finished before the winter winds whip across the farm fields. I know we are pushing it to the brink. These last few days of Indian Summer won’t last long, then winter will most certainly be here! Hogs on pasture is nothing new. Folks raised their pigs in this fashion for centuries, but then the “modern farmer came along and crammed large numbers of pigs into barns and onto feedlots. These confinement operations were for “efficiency” the experts said. Chores can be done in minutes rather than hours. Feed and manure can be handled much better. The hogs can be moved or sorted easier too. One of the greatest things, according to the experts is, that the pigs will clean the manure from their own pen! I got to that work a time or two and I knew before I could see it, that there must be a better way…. I could smell the self cleaning pens long before I could see them. The pig stalls were quite large, with 25-30 pigs in each one. The floors were slightly slanted towards a slatted trench. As the pigs walked around, the 3 inches of liquid manure would flow towards the slats by gravity and eventually ooze through into the trench below. That trench was also slanted so the manure would slowly ooze to an outside pond. No bedding of any kind was used, because it would mess with gravity and plug up the system. The high part of the slanted pig pen was were the pigs ate and slept. The floors were wet and slippery with manure from the pigs feet. I am sure the floors were cold too. I felt sorry for the pigs at the hands of the so-called experts. 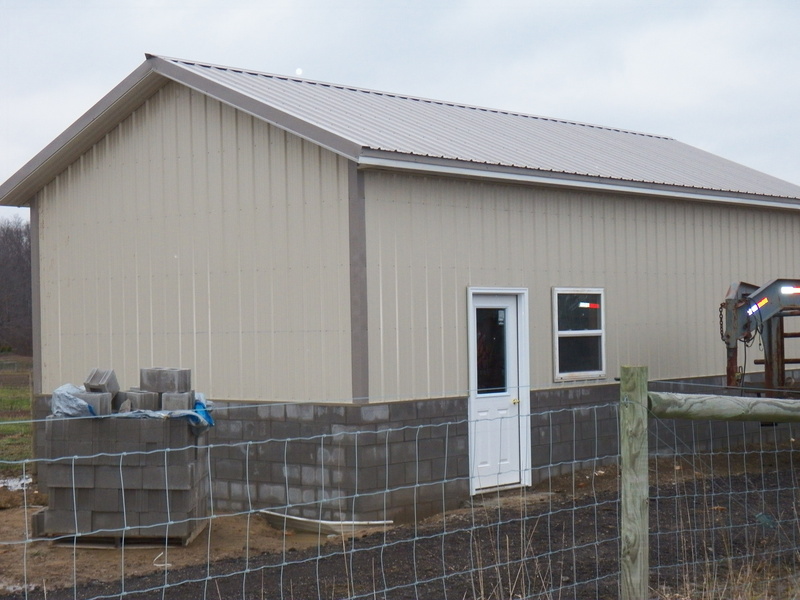 Government officials came from far away to see this updated wonder for rasing pigs “humanely and efficiently”. 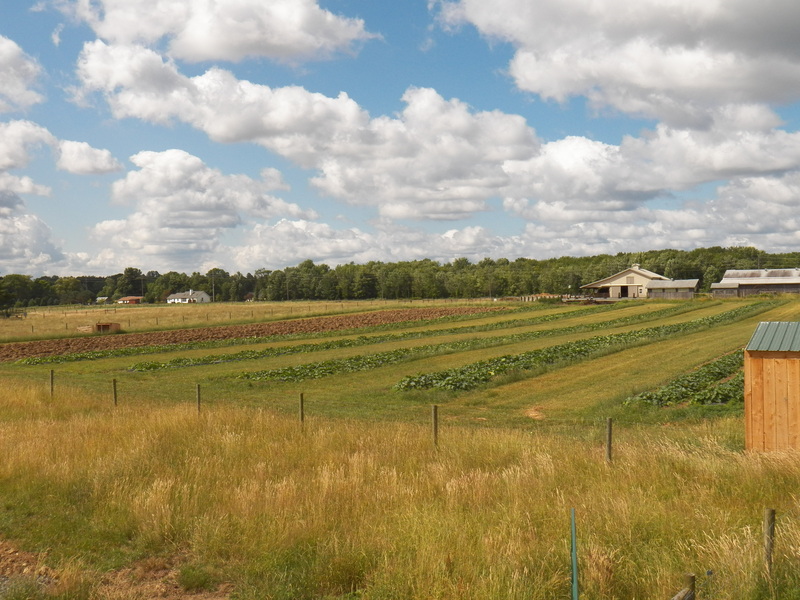 They blessed the farm with many permits so nearby neighbors could only complain, but do little else…. other than move away. 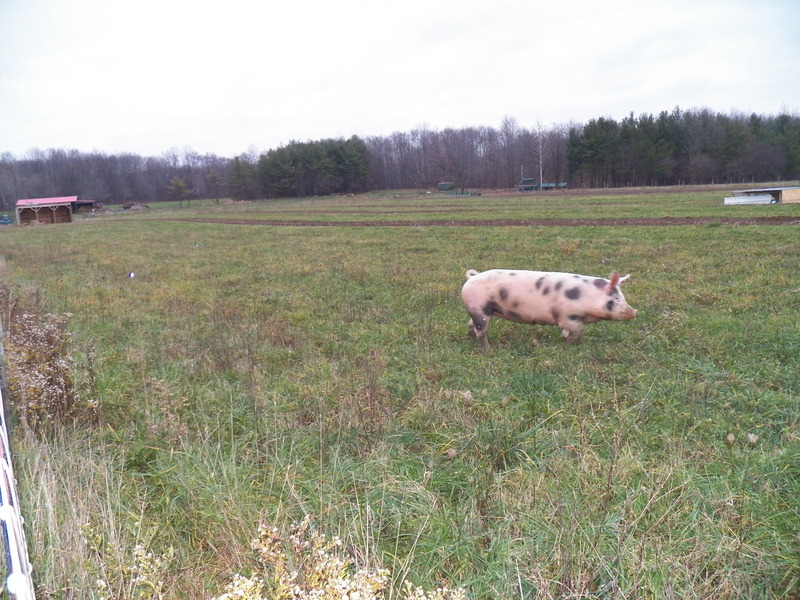 I watch my hogs roam our pasture and cuddle down in deep bedding on cold nights. I see babies chase and play, then run to momma to nurse in batches of eight or ten. I see them root out treats and vegetables grown for them and supplement their diet with roots and grasses from our pastures. I can’t help but wonder how those experts got it so screwed up in the first place! My pigs are clean. Their sleeping area is bedded and soft. I move and sort them slowly with patience and repetition. They start out by following mom. They next run in and out of the pig barn for water or to play. They don’t fear me and many come when I call them. They live a stress free life here on our farm. Sure, we eat them and I sell to many other folks who eat them. Stress free hogs raised with compassion and locally grown farm raised corn, soybeans, pasture treats and all the fresh water they can drink, make for some very tasty pork! I will say that many folks don’t want the chores that I have. Many small farmers were pushed out of the hog business by the large feeding operations because of those self cleaning pens, quick feeding methods and easy moving and sorting. The feed companies bring feed in with all sorts of stuff mixed into it ..including bones, fat and meat from other animals for those pigs to eat. The “expertly” raised hogs are often placed on the farm by a big company. The farmer is merely an indentured servant pushing buttons to care for the livestock and making perhaps $5.00 per head once the animals head off to market. It is important to him to have raised lots of them in a years time… I’m sure it’s not so great for the animals though. It is not just the hogs who are pushed onto cement lots to live in filth. The beef and dairy industries are also headed this direction and quickly too. One farm with 1200 cows takes the place of forty farms with 30 cows. The manure was once spread over the land of forty farms, is now concentrated in lagoons and pumped to fields near the big farms of the 1200 cows. The nutrient rich manure once held in high regard for fertilizer, is now a waste product and a nuisance for farmers that use the petroleum based fertilizers…made practical by the “experts”. I know what is right. I see it work here on my farm. The once depleted fields are now lush green and able to support many head of livestock. The manures from many species of animals, composted then spread on my fields makes them productive. The animals stay healthy in my pastures and barns. I have control over my pork from the womb to the tomb.. I am sure Tyson can’t compare with that “chain of custody”. Not Derailed … On Siding! Ok , it is a play on words 😮 Connie and I have both had ailments. Both of us are on the mend. I felt good enough the last two days to complete the siding on the wash-house. 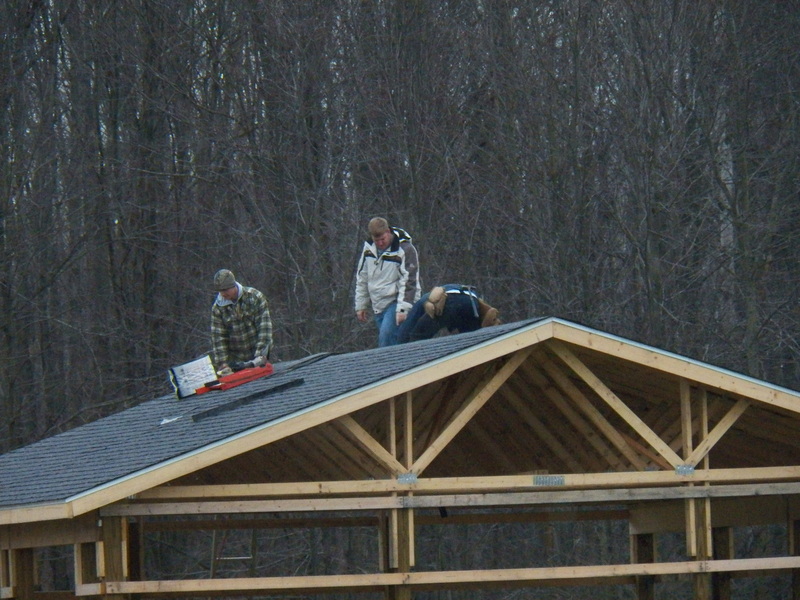 I worked with my friend and my hired man, both days until dark… But the job is complete and we are ready for winter! Illness almost derailed my plans. I sat and looked out the window for several days. I spent a couple of nights alone while Connie was in the hospital recovering from a hernia surgery. Then like a train resting on the siding, it was time for us, to start moving again. Both of us were saying that little limerick , “I think I can, I think I can, I think I can…” It worked we can 😮 Well , okay we are slow, but it is forward progress! We have another litter of piglets, eight this time. Mom and babies are doing well. The cold night last night was no problems for them as they nestled down in the fluffy straw nest. Today they were back to racing and chasing around the pen. Babies are the high point of this farmer’s life. Much work remains on the wash-house, but with the whole thing closed up, the rest of the work will be easy to do this winter. We have chickens to butcher soon. I think the wash-house may get its maiden voyage for that job. We will be in out of the wind, with a floor we can wash with a hose… I know Connie is all for that!